The Trigger Editor proposes a diversity of controls and shortcuts to manage and combine Triggers and Trigger Operators. This page lists all the classic manipulations helpful in designing and debugging a Trigger Graph. 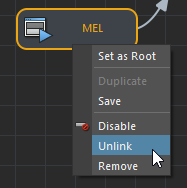 Drag-and-drop a previously created Trigger/Trigger Operator from the Trigger Outliner inside the workspace. 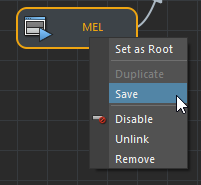 Triggers, Trigger Operators and Trigger Containers can be saved in a file (Maya ascii file) as a Custom Trigger and then reused in another simulation or shared between users. Notice that in order to work fine inside a complete different scene than the one where the master Trigger was saved, all meshes and objects mapped to saved Triggers are also saved (for example the zone trigger mesh of a Polygon Zone Trigger). The new Custom Trigger is saved in a Custom Trigger Directory. This directory can be changed in the Crowd Settings or by choosing "Set Custom Directory" in the contextual menu of the Custom Triggers Library. Notice that if no Custom directory is set in the Crowd Settings, a dialog will ask you to choose one. 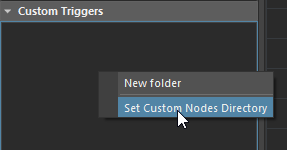 Drag-and-drop a Custom Trigger from the Custom Triggers Library into the workspace, if the Custom Trigger is a Container double-click to open it in a new tab. The Custom Trigger is automatically loaded and ready to be linked and simulated. Either by directly putting the file in its own Custom Directory. 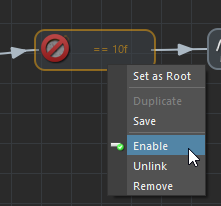 The Custom Trigger is then automatically available in the Custom Trigger Library. 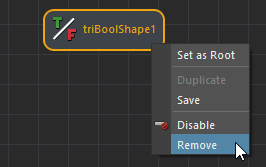 In Trigger Editor Main workspace, right-click on the drag-and-dropped Trigger and "Save", as previously described. 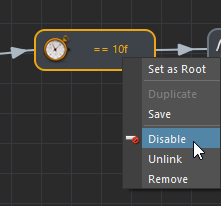 Triggers can be disabled inside the Trigger Graph to help designing and debugging complex actions without modifying the Trigger Graph. The disabled Trigger is overlaid with a disabled icon . A disabled Trigger is not evaluated during simulation, the next Trigger marked as enabled will be played.